Flexpak offers several different types of plastic packaging solutions for pallets and bulk good shipments.The type of plastic has a great influence over the quality and strength in packaging design. While some plastics are better for stretching, some plastics are designed to withstand tears, and some allow for greater breath-ability. Choosing the right plastic when covering goods should take into account three main areas: what is the product being covered, how is the product being shipped, and what kind of advertisement/print is needed? 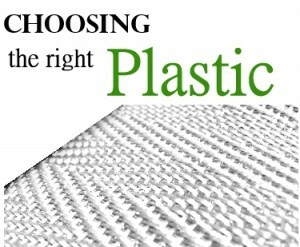 Different types of plastics provide solutions that meet the needs of this criteria. Flexpak continues to innovate packaging design based on plastic strength and hybrid pallet cover designs. 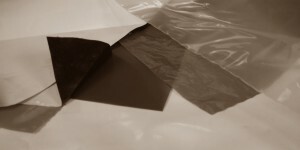 Heat-sealing application is continually be modified and improved to design packages that cannot be produced in any other facility in the world. The goal is to create cost effective solutions to packaging bulk goods by adding strength, ease of application, and allowing for greater graphic application to plastics. It is a secret. There have been several cover designs and poly modifications which have allowed greater breathability in packaging. Flexpak continually works to provide airflow into packages while keeping moisture from destroying goods in shipment. See Hybrid Design or Breathable Lumber Covers for more information on plastic packaging. Please feel free to contact Flexpak at any point to discuss packaging issues or to receive more information on the types of plastic packaging Flexpak can offer in different designs. Flexpak has been providing custom packaging for a variety of products for over 20 years. The specialty is found in our unique ability to provide cost effective design in pallet covers and lumber packaging. The ability to provide a custom pallet cover is unmatched in the industry due to both machine capacity and industry knowledge. We strive to find cost effective solutions to every problem our customers may face. With continual improvements to heat seal design, our capacity and expertise is unmatched in the packaging industry.